Our 2017 Teaching with Technology Survey found that faculty have a positive outlook about technology’s impact on their work, teaching effectiveness, student learning and more. 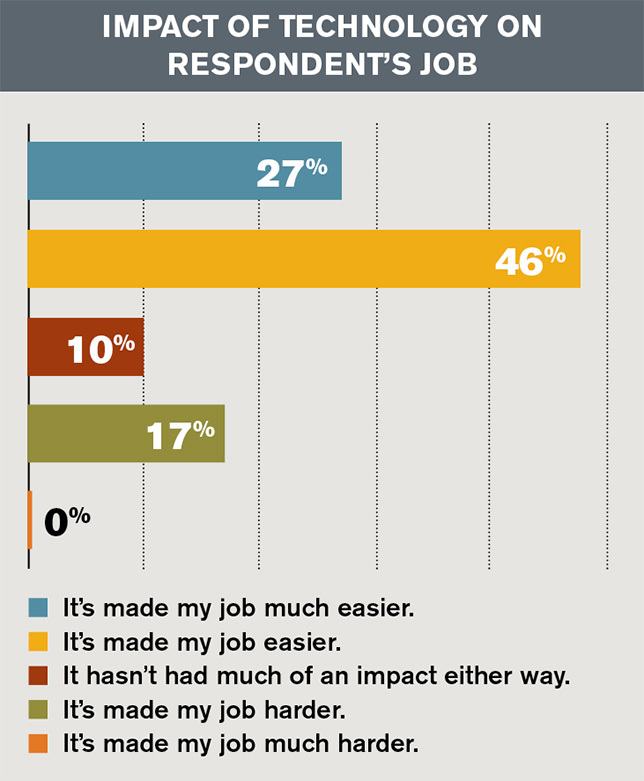 In a survey of faculty members at colleges and universities across the United States, 73 percent of respondents said technology has made their jobs “easier” or “much easier.” And nary a one considered their job “much harder” thanks to tech. Those findings came out of Campus Technology‘s second annual Teaching with Technology Survey, in which we asked faculty to dish on their use of technology, likes and dislikes, views of the future and more. Their responses revealed a lot about the business of teaching and learning with technology today — and how it has changed over the last year. While 73 percent of faculty were positive about the impact of technology on their jobs, that count represented a slip of four percentage points from last year, when 77 percent believed the same. The number of faculty who think technology has made their jobs harder is holding steady (17 percent this year compared to 16 percent in 2016), and a growing faction feels that tech has not had an impact either way (10 percent this year compared to 6 percent in 2016). Whether technology is making life hard or easy for faculty, the majority of respondents (85 percent) feel the effort is worthwhile, agreeing that “Technology has positively affected my ability to teach.” That number is slightly lower than last year, when 88 percent felt the same. The results were similar when it came to technology’s impact on student learning. Eighty-one percent of respondents saw a positive effect, compared to 84 percent last year. And 13 percent feel tech hasn’t affected student learning one way or the other. “Technology is only as successful as the teacher who uses it,” noted one respondent from a public university in California. Overall, faculty in our survey hold an upbeat view of technology’s value in higher education: Eighty percent think tech has had an “extremely positive” or “mostly positive” impact on education, similar to last year’s count of 81 percent who felt the same. “As with any facet of teaching and learning, there needs to be enough time for faculty to learn to properly use, adapt and implement for technology to be beneficial,” pointed out a respondent from a Florida university. The full results of the Teaching with Technology Survey appear in the July digital issueof Campus Technology. Highlights from the survey will also be posted on this site over the coming months. You can check back for ongoing coverage in our Research section. Our survey polled 232 faculty members across the country about their use of technology in the classroom, their likes and dislikes, their predictions for the future and more. The majority of respondents (68 percent) come from public institutions, with 28 percent from private nonprofits and 4 percent working at for-profit schools. Seventy-two percent work at four-year colleges or universities; 26 percent are at community colleges (the remaining 2 percent designated their institutional level as “other”). Respondents represent institutions of a range of sizes, with about one-third (32 percent) working in colleges or universities with 2,500 to 9,999 students. Just under half (45 percent) of respondents are from institutions with 10,000 students or more. Our respondents are veterans of higher education: The largest group (47 percent) has more than 20 years of experience, with 81 percent logging at least 11 years in the field. The top three most common school and college types among our respondents are education (22 percent), business/business administration (17 percent) and liberal arts (12 percent). But overall, respondents work in a wide range of disciplines, from engineering and medicine to humanities and fine arts. The top 10 states with the most survey respondents are New York, Texas, California, Florida, Georgia, Virginia, Illinois, Missouri, Pennsylvania and Massachusetts. Working with German professor Dr. Diana Stantcheva from the American University in Bulgaria (AUBG) as a collaborative team within GLCA’s Global Course Connections Program over the past four years has been a most productive and enjoyable journey. 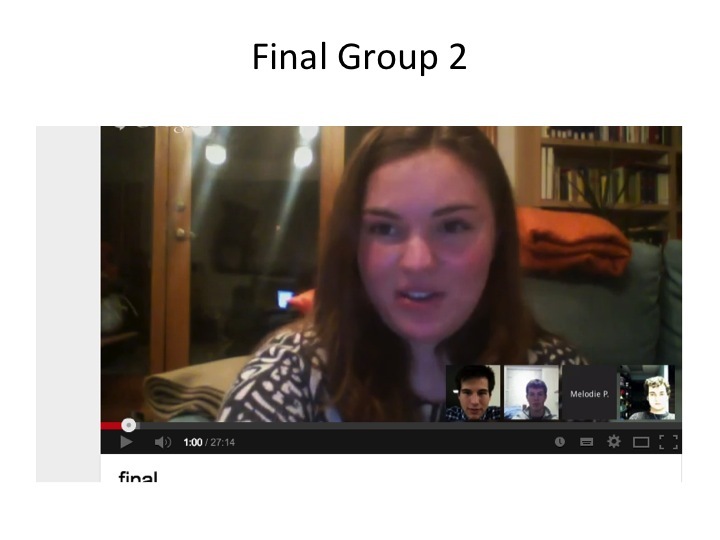 Both Denison and AUBG students have been collaborating on a great variety of projects for 7 continuous semesters. These courses have ranged from intermediate to advanced level , from language to content-focused, and from simple technologies to complex digitally innovative courses. Students on both sides have gotten to know each other and both professors over the years, and it’s not been seldom that students who had worked together on a digitally supported project found each other to be partners again three semesters later. Via Google Hangouts and later Zoom video-conferencing students on both sides have met regularly over time to discuss American and East-European culture, US and German politics, the refugee situation in Europe, German media, Homosexuality in German film, gender and family, and linguistic phenomena, and much more – all in German! This fall, on November 7th, Dr. Stantcheva came to Dr. Dillmann’s “Media in Germany” course to discuss the US presidential election from a European perspective with the class. In turn, students in the course explained and discussed the American voting system with Dr. Stantcheva who was extremely impressed both by how politically informed our students were and how well they were able to describe the complex election system and state their own opinions on the two competing candidates in very clear German. Dr. Stantcheva’s husband Vladi, an accomplished artist based in Sofia and Berlin, joined us for a campus tour where he talked with several students in German. He was particularly interested in students working at the election information table in Slayter Hall and likewise impressed by how politically savvy and engaged our students are. The stereotype that young Americans are indifferent to the politics in their own country was certainly not confirmed on our campus. Definitely a highlight of Diana’s and Vladi’s visit – according to both Diana and Vladi – was visiting the Mulberry MixLab with its director, Christian Faur, showing them the lab space with its manifold artistic production programs and demonstrating to them how the various 3-D printers set up in Mulberry and the Bryant Arts Center function. Diana was especially delighted about the special gift she received from Christian: her name laser-cut into a piece of wood. We concluded the evening with a meal at Day Y Noche, where two of our Denison students had the pleasure to be captured spontaneously in a portrait drawing by the artist at the dinner table. They said that they would always treasure this unexpected gift. Thank you, Diana and Vladi, for your visit and sharing your thoughts and experiences with our students! In the Spring 2017 semester, Earlham, Denison, and Oberlin will offer their first Shared Languages Program courses. This program is an initiative funded by a Mellon grant, Global Crossroads, with which the Great Lakes Colleges Association is supporting campus internationalization and globalization efforts throughout its 13 domestic consortial college member institutions. In Arabic, Dr. Kelly Tuttle will teach Arabic 341: Alienation in Modern Arabic Literature (in Arabic) at Earlham College while Dr. Hanada Al-Masri will be offering Arabic 300: Media Arabic (in Arabic) at Denison University. Dr. Basem Al-Raba’a will be encouraging Oberlin students, who would otherwise not have the opportunity to continue their Arabic language studies, to participate as guest students in these upper level Arabic courses. Allegheny’s Arabic professor, Dr. Reem Hilal, as well as DePauw’s Arabic professor, Ghassan Nasr, are looking into identifying students for whom these course offerings would be a great opportunity to continue their Arabic studies. In German, Dr. Gabriele Dillmann will offer German 305: Migration to and from Germany and the EU since 1945 (with a special focus on the current refugee crisis) at Denison University in collaboration with Hope College’s German professor Dr. Lee Forester who will encourage Hope German students to engage not only with Denison students in this course but also with AUBG students as part of the Global Liberal Arts Alliance Global Course Connections program. As a globally connected course, Dr. Dillmann’s students have meaningful opportunities to engage with students from diverse cultural backgrounds at the American University in Bulgaria. Albion’s German professor Dr. Perry Myers has expressed interest in participating in the program in the near future. The Shared Languages program has been in the making since January 2016 and has since then been directed by Gabriele Dillmann for the GLCA Crossroads Initiative. Interested faculty have met during two summer workshops for Arabic, respectively German to discuss language pedagogy, course content, digital pedagogy, and course logistics. A follow-up working group meeting will take place in December at Denison U to discuss course assessment strategies and faculty will offer a show and tell of their pre-pilot work in their current Arabic and German courses. Logistical and technological details have since been worked out with the help of our participating schools’ four highly engaged registrars and apt IT personnel, and an informative Student Q&A has been created. Many thanks to Simon Gray (Program Officer at GLCA) and all my Arabic and German colleagues, registrars, and IT personnel who are making this exciting new program happen!! ACTFL 2015, San Diego, November 21, 2 pm. A big thank you to all of you (we counted 96+!) for coming to our presentation as well as for your interesting and stimulating questions and comments! As promised, below you will find all the materials and the complete presentation. Please use as you deem appropriate, but do give us credit if you use the materials in their entirety or a significant amount/part of them. New digital technologies and innovative hybrid teaching models transform how we teach students communication skills both inside and outside the classroom. In particular, oral proficiency dramatically improves with digital pedagogies compared to the traditional FL classroom. 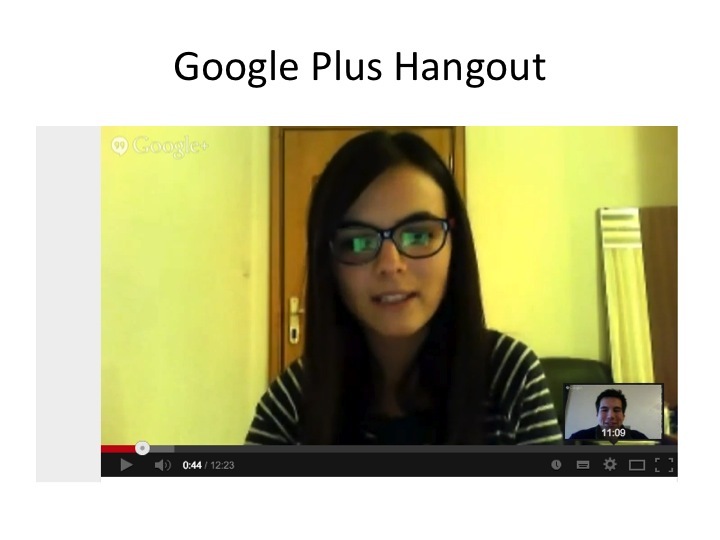 Such tools as Google+ Hangouts and Zoom with their multifunctional interaction tools (screen sharing, chatting, etc.) and Blackboard Voice Board have made online hybrid learning uniquely interactive, intuitive, inexpensive, and inviting for both students and teachers. These tools provide the individual student with more speaking opportunities, in pairs or in small groups, and task-based follow-up exercises, which then allow for constructive and structured feedback from the teacher. This pedagogical approach is especially useful in a globally connected learning context, where students increase both their linguistic and intercultural competencies. Students also learn digital skills and dialogue etiquette in a global context. – explored feedback strategies appropriate for these tools. 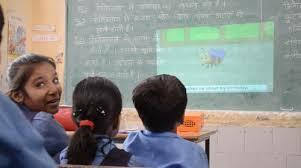 Participants were introduced to Google+ Hangouts, Zoom, and Blackboard Voice Board via the appropriate technology, i.e. specially prepared modules (ppt/slides/video material) was projected to the screen from a laptop and discussed allowing for feedback along the way. We discussed specific examples of the actual experience with these tools from both German and Arabic intermediate-level language courses inviting participants to reflect on their own experiences and pedagogies. We provided supporting materials, such as handouts of a rubric for both guidelines and assessment/grading, a description of a variety of class activities, and websites for further learning. This fascinating project shows us how with creativity and intelligence innovative activists can make a huge global and social difference with limited funds and means. Watch Innovators in Education Episode 5 with Prakash Paudel from Lumened.org to learn more. 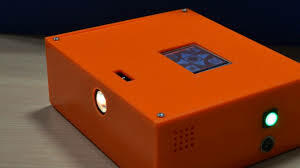 The 5 former Oberlin College sophomore students raised money for their project “The Bright Orange Box: Connecting Classrooms” with Kickstarter. 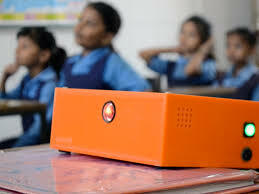 The Bright Orange Box is a smart projector that brings digital tools to disconnected classrooms and connects students across the world. It works without reliable electricity and without internet access. The specific project connects kids in distant classrooms globally in a two-way system, i.e. each receives and produces content, in a digital video pen-pal program. The current project connects classrooms in the US with classrooms in New Delhi, India but can be extended to global partner schools in diverse geographic locations. The Huffington Post calls this innovation: The Projector That Will Redefine Classrooms. I look forward to learning more about this exciting project in the near future. 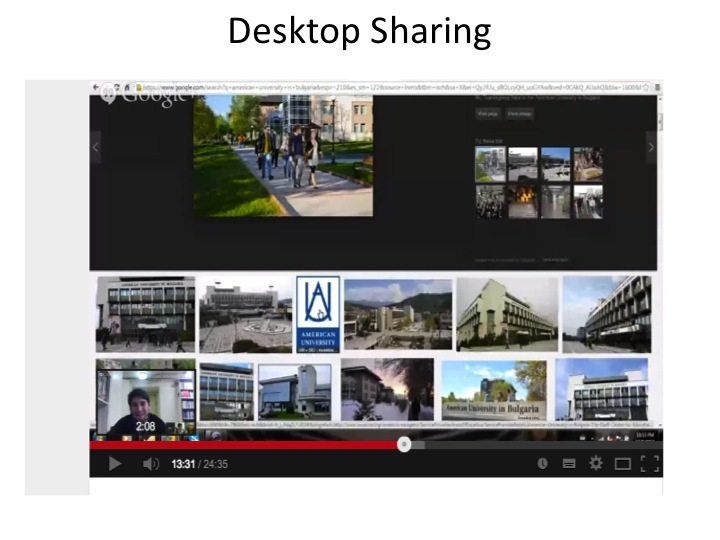 Thank you, Cheryl Johnson (IT @ Denison U), for pointing out this video recording to me! The language classroom is a most fruitful place for intercultural, global learning. Digital technologies allow us to make intercultural connections like never before and in the process language learning benefits from real communication about real issues. With new cloud- based technologies and a sharp increase in hybrid teaching models, innovative, technology-enhanced teaching and learning projects within a global connections context have become more readily realizable. Specifically, in the language and culture classroom, such video conferencing platforms as Google+ Hangouts, Adobe Connect, and Zoom with their multifunctional interaction tools (screen sharing, chatting, etc.) have made online hybrid learning uniquely intuitive, inexpensive, inviting and “human” for both students and teachers. Concrete examples show how both linguistic and cultural proficiencies as well as digital competencies – applicable in any teaching and learning context – are enhanced in the globally connected classroom. In addition to the technology itself, students also learn digital and dialogue etiquette, how to be effective team players and members of a learning community, and develop group and leadership competencies within a digital context. To listen to the talk (talk #8) and view the slides, please click here. Denison Tuesday Lunch Series, March 24, 2015, Knobel Hall. Our joint case study on the globally connected language classroom was recently published in the online journal “Transformations” on the Academic Commons website. Summary: The language classroom is a most fruitful place for intercultural, global learning. Digital technologies allow us to make intercultural connections like never before and in the process language-learning benefits from real communication about real issues. Connecting two language courses globally requires overcoming many obstacles and challenges (time difference, collaboration, technology, funding, resources, etc.) but a strong belief that the benefits outweigh the costs serves as a constant source for pushing on. We look forward to comments from colleagues and students alike! A special Dankeschön! to our students in German at Denison and AUBG for your engagement and enthusiasm in this teaching and learning project! Increasing cross-cultural understanding and buidling up a community where knowledge is shared on a global level and is easily accessible by everyone – this ambitious goal has brought together two enthusiastic ladies teaching German. Gabrielle Dillmann from the Modern Languages Department of Denison University (US) and Diana Stantcheva, AUBG Associate Professor of German presented their successful project of linking two intermediate German courses at this year‘s Student Faculty Research Conference at AUBG. The project was realized through the Global Liberal Arts Alliance partnership, which seeks to facilitate the exchange of knowledge and experience among liberal arts institutions around the world. It involved active participation on the part of not only students and facutly, but also staff members at the two institutions, and showed that teamwork and true engagement lie in the heart of a successfull globally connected course. Getting to know another culture through learning its language is just one of the steps to developing an intercultural competency. Another important element is acquiring dialogue etiquette and the ability to cooperate with peers from around the globe towards achieving a common goal. Lastly, such global projects can only be accomplished provided that participants possess sufficient level of digital proficiency and digital etiquette. “Facebook texting is not a measurement of digital literacy”, pointed out professor Dillmann. “Students need to learn how to use tools like Google Docs, video conferencing tools such as Jabber and Hangouts, as well as desktop sharing tools.” Apart from providing forum for students to enhance their language comptency level, this initiative aimed at teaching students skills sets that would allow them to make meaningful contributions to their globalized societies. Throughout the course students had to complete e-mail communication assignments, shared information about interesting aspects of their home institutions, engaged in an extremely useful exercise on overcoming intercultural differences and held a conversation via Google Hangout on air. Each of the four components was followed with detailed in-class discussion on how the particular tasks were performed, what obstacles students faced and how they managed to resolve them. Both professors shared that students were extremely excited about the project, showed a sincere commitment to the tasks and many student pairs reconnected after the conversation assignment in order to continue their chats. The growing interest of universities around the world in exploring the vast possibilities of modern technologies clearly indicates that the creation of a global learning community is indeed possible and under way. As an institution that stays abreast of the latest trends in the educational field, AUBG is committed to provide both its students and its faculty with a variety of opportunities to enrich the learning process. This said, the two globally linked institutions have pledged to continue their academic collaboration and move a step closer to achieving their mission – global community of learners and education without borders. For his world regional geography class at Allegheny College last fall, Eric Pallant arranged for his students to videoconference with a class at Forman Christian College, an English-medium institution in Pakistan. It was Pallant’s second such experience teaching a “globally connected” course: the spring before he had taught a class on food and agriculture in collaboration with a professor at Morocco’s Al Akhawayn University. Among the assignments Pallant had planned for the geography class, the Allegheny students were to prepare detailed reports on the physical and human geography of their town, Meadville, Penn., while the Pakistani students would do the same for their country. The two classes would exchange and present on their respective findings. Further, the video picture was fuzzy and the sound quality poor, a problem compounded by the issue of accents. And though this was less of a problem for the Pakistani exchange, in the case of the Moroccan course collaboration Pallant’s students faced challenges related to different cultural conceptions of time. The American students were anxious about getting the group assignments done by the stated time on the syllabus, while their Moroccan group-mates tended to have a much more, well, fluid conception of deadlines. “Lest you think this is all negative, what I ended up realizing and saying to my students is, ‘You’re going to go out there in this globalized world and you need to learn how to negotiate these things’ – a different sense of time, accents, technology that doesn’t work the way you expect it to, perceptions of Americans overseas,” said Pallant, the chair of environmental science at Allegheny. In other words, “it turned out to be a fantastic learning tool,” he said – though not for the reasons he had expected. As colleges look for cost-effective ways to internationalize the on-campus learning experience, globally connected courses such as Pallant’s may become more common. The use of technology to enable virtual exchanges and collaborative assignments between geographically distant classrooms is not brand-new – faculty, especially foreign language faculty, have been doing it in pockets for as long as there’s been email – but there seem to be an increasing number of efforts to scale up and institutionalize these kinds of activities. “In the last 18 months to two years, there’s been the beginning I would say of a sea change where SIOs [senior international officers] and provosts and other folks who are higher up on the campus are taking notice of this for different reasons and saying, ‘This is a good idea; how can we support it?’ ” said Jon Rubin, the director of the State University of New York’s Center for Collaborative Online International Learning, which goes by the acronym COIL. This type of teaching goes by many names – COIL, online intercultural exchange, virtual exchange, globally networked learning, telecollaboration. In this context they all mean more or less the same thing, and that thing is broad: the use of technology, any technology, from email to social media sites to video-chat software to blog platforms to wikis – to facilitate class discussions and do collaborative course assignments across national borders and time zones. The course exchanges can be synchronous or asynchronous, or involve a combination of both. COIL is often described as an alternative to study abroad, a low-cost, easy substitute of sorts for that 90 percent or so of undergraduates who never go overseas. Asked if it’s oversold in that way – after all, study abroad has been characterized as a particularly high-impact educational experience – Rubin said the problem with the language of “alternative” is it suggests a COIL class would be study abroad’s equal. Generally speaking it’s not, he said, but that doesn’t mean it’s not a potentially powerful learning opportunity in itself. Other practical challenges cited by survey respondents included differences in academic timetables and in language proficiency levels (outside of foreign language classes, most of these types of collaborations are conducted in English), and a lack of institutional support. The issue of institutional support — such as assistance from an instructional designer and/or an information technology expert — comes up frequently in discussions about COIL (or whatever else it’s called). After participating in a National Endowment for the Humanities-funded institute hosted by the SUNY COIL center, 15 of the fellows said they wouldn’t be running a second iteration of the COIL course they’d designed compared to just 7 who would. Fellows cited a lack of partners and/or resources as their main reasons for why the course wouldn’t be continuing while those seven who did have plans to do it again had one thing in common: they all indicated that their institutions are committed to building on the work they’d begun. “Although COIL can be considered a low-cost cost approach to internationalization at home, it is not no‐cost,” the final report on the NEH institute says. Among the places where COIL has taken hold, within the SUNY system, the Oswego campus has provided financial incentives in the form of $3,000 stipends for faculty to develop a COIL course and $1,500 stipends to redesign an existing one. Lorrie Clemo, SUNY Oswego’s provost and vice president for academic affairs, said that faculty developing COIL courses receive support from an instructional designer, from the center for teaching and learning, from a staff member in the international education office and from an information technology staff member who helps with the technology when the class is up and running. Asked why she’s making COIL an area of emphasis, Clemo said it’s a matter of scale and maximizing the number of students impacted. “I do think there’s tremendous potential for scaling this up so that many more students have the opportunity to experience an international connection if they aren’t able to study abroad,” she said. Ulster County Community College, an institution in the SUNY system, has developed a number of COIL courses, including a planned collaborative genetics class with a university in Mexico and classes on entrepreneurship in collaboration with universities in Lebanon and Brazil. Outside of SUNY, Mount Holyoke College has a telecollaboration initiative through which about 40 faculty members have led class discussions with invited speakers or with students at universities in other countries. East Carolina University is offering 20 sections this fall of its hallmark “Global Understanding” class, created in 2003, in which students engage in group video and one-to-one chat discussions on topics like family and stereotypes and prejudices with students at three different universities in three different countries over the course of the semester. And the Great Lakes Colleges Association has so far involved about 36 faculty members in its “Global Course Connections” project connecting faculty at the various institutions in the consortium it manages, the Global Liberal Arts Alliance. Allegheny’s Pallant organized his course exchanges through the Great Lakes Colleges Association Global Course Connections project, as did Gabriele Dillmann, the Julian H. Robertson Jr. Endowed Professor at Denison University, in Ohio. Dillmann had long been looking for opportunities to connect her German language students with peers overseas, but she’d found it difficult to forge a mutually beneficial exchange between her students and students in Germany who, of course, speak German fluently and tend to speak English quite well too. Only recently did she consider the possibility of creating connections between German language learners in two non-German speaking countries. This past fall Dillmann embarked on a collaborative class with a German professor at the American University in Bulgaria. In a series of homework assignments, students wrote emails to one another introducing themselves and their reasons for learning German and describing their home campuses. 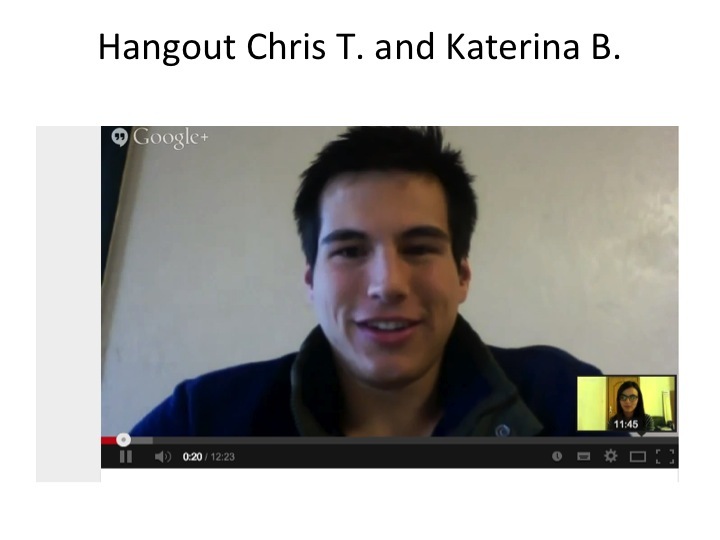 As a centerpiece of the collaboration, two students each from the two institutions met for four-person discussions on the topic of planning a trip to Bulgaria using Google+ Hangout; Dillmann received a link to the saved chat and assessed the Denison students using a rubric including not only linguistic skills but also skills like digital etiquette and group and leadership competencies. As MOOC fever recedes yet the debate about online learning’s future chances and challenges becomes both more realistic and pressing, the humanities urgently need to get more creative and reflective about imagining their future in higher education. This session will discuss concrete ideas and best practices for embedding digital pedagogy assignments and tools into four different kinds of classrooms and courses (foreign language, literature, storytelling, and writing), not only to memorialize and simply transpose what we already do into a different medium, but in order to harness unique affordances of new tools and connected ways of learning that widen the scope of what and how we teach for the 21st century. If we want our students to become mindful global citizens with a sound mastery of digital skills appropriate for this day and age and connect these with the knowledge memories and critical thinking skills that a solid humanities education provides, we need to harness technology in pedagogically creative ways and bring the humanities back into the heart of an increasingly digitally connected society. Gabriele Dillmann’s talk “Fostering Global and Digital Learning with Google+ Hangout as a Communication and Knowledge Sharing Tool” launches our session with the example of using Google Hangouts in the German language and culture classroom to connect with other students and teachers worldwide. With new cloud-based technologies and a sharp increase in hybrid teaching models, innovative, technology-enhanced teaching and learning projects within a global connections context have become more readily realizable. Specifically, in the language and culture classroom, Google+ Hangout with its multifunctional interaction tools (screen sharing, chatting, whiteboards, presentation software, etc.) has made online hybrid learning uniquely intuitive, inexpensive, inviting and “human” for both students and teachers. We need to teach students more than the technology itself, however: they need to learn digital and dialogue etiquette, how to be effective team players and members of a learning community, and develop group and leadership competencies within a digital context. Dillmann will present concrete examples and offer teaching and learning materials from her intermediate level internationally connected German language and culture course that show both how to use this tool to enhance linguistic and cultural proficiencies, as well as digital competencies that can be applied in any teaching and learning context. Petra Dierkes-Thrun’s paper “How To Do Things with Books and Screens: Literature and Digital Pedagogy” offers three concrete examples of digital pedagogy in the literature classroom that newly engage students and bring traditional humanities contents and methods to a larger public. An assignment she pioneered in 2012, a popular literary Twitter role play for Wilde’s The Picture of Dorian Gray, playfully reimagines this classic novel and posits reading and interpreting literature as creative social functions. In her second example, an Image and Sound Interpretation (using only images, audio, video, but no words, to interpret a poem), students create a collaborative synesthetic digital space that expands traditional close reading methods and goals. Dierkes-Thrun’s third example is a final assignment that replaces the term paper with a teaching sequence, student-produced pedagogical rationale and teaching materials developed by students, for other students or community organizations, which illustrate a new pedagogical paradigm of “critical contribution” online (Cathy Davidson’s term for students’ productive contribution to society via knowledge sharing). The unique new affordances of digital media also increase motivation, Dierkes-Thrun argues: teaching and learning collaboratively and playfully, integrating critical contribution and public outreach into traditional literature course, and giving students (and teachers) a larger sense of purpose and audience for their work. Alan Levine’s talk “Assignment Riffing: What Happens in DS106 Does Not Stay in DS106” expands our session’s conversation beyond the course, unit, or a particular institution. Unlike MOOCs (of c and x variety), his open digital story course ds106 uniquely stands as more than one course, but as overlapping ones from multiple institutions with a cloud of open participants. Its Internet radio station and Daily Create challenges offer opportunities outside the course. An open assignment bank not only gives flexibility to choose assignments, but also invites participants to add new ones, a living example of the “adjacent possible” in a course. It may appear ludicrous to house assignments for editing images of famous paintings to include fat cats, creating poetry from titles of songs, or putting fast food in the hands of internet pioneers, but the media created are not the end goals in ds106. Participants open their apertures of creative interpretation, incorporate works of others in a constructive fashion, and narrate their creative process. A frequent spirit of spontaneous “riffing” occurs, not unlike that of improvisational jazz musicians, that ripples far beyond the confines of one course. Finally, Amanda Starling Gould’s “Assignments, Assessments, and Makerspace Methods in the Literary Digital Humanities Writing Course” offers her Augmenting Realities Duke university undergraduate course as an example of how one might enact a literary digital humanities writing course, detailing the method, motive, and several tested modes for digital project assessment. Because syllabi and course assignments can be as instructive as methodological explanation, the main focus of this presentation will be a hands-on introduction to several digital humanities assignments in the course. Assignments as Digitally Annotating the Graphic Novel, the Final Transmedia Essay & Collaborative Web Journal, Creating Dynamic Digital ePortfolios, the Impossible One-Slide Presentation, and a grand Google Glass Literary App Challenge, invite audience attendees to explore the assignment specifics, tools used, and the students’ final products, and understand their integration within the narrative of the course. Gould’s case study, as well as our special session’s as a whole, aims at sparking critical innovation for integrating the digital into all humanities disciplines and to encourage experimentation that resists the traditional boundaries of contemporary pedagogy in order to facilitate rigorously creative digital learning environments. These papers are likely to provoke a lively discussion ranging from exchanges of concrete pedagogical ideas and best practices of yesterday and today, to more conceptual, fundamental, and controversial reflections on the challenges and opportunities of teaching language, literature, writing and storytelling digitally today and tomorrow. 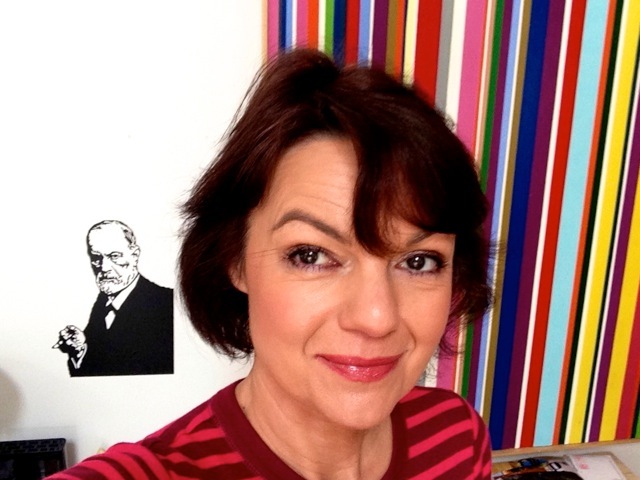 Gabriele Dillmann, Associate Professor of German at Denison University, teaches courses in German language, German, Swiss, and Austrian literature and culture, and seminars on psychoanalytic theory and neuropsychoanalysis. In her teaching she makes innovative use of newest digital technologies to foster language skills, intercultural competencies and global learning, for example in her globally networked German course with the American University in Bulgaria. She is also very dedicated to Cultures and Languages across the Curriculum (CLAC) and team-teaching pedagogies. Her scholarly interests are increasingly vested in how digital technologies shape how we learn and teach now and in the near future. Her more traditional scholarship is in the area of German Romanticism and psychoanalytic theory, specifically suicide studies. For an updated account of her most recent projects, please visit https://gabrieledillmann.wordpress.com. Last year, she was awarded the Julian H. Robertson Jr. Endowed Chair at her institution for her work in teaching, service, and scholarship. Petra Dierkes-Thrun is a Lecturer in the Comparative Literature Department at Stanford University with interests in Victorian, fin-de-siècle, and modernist studies, as well as feminist and LGBTQ studies. Her book Salome’s Modernity: Oscar Wilde and the Aesthetics of Transgression was published by The University of Michigan Press in 2011. Petra serves as advisory editor for boundary2 (Duke University Press), founding editor of the international online journal The Latchkey: Journal of New Woman Studies, and board member for Rodopi’s Dialogue series. Petra actively incorporates digital pedagogy into her literature and gender studies seminars at Stanford, developing new kinds of student exercises and activities involving social media, learning collaborations with the public, and digital student projects aimed at thoughtful, creative engagement with traditional humanities contents and methods via the new media, as well as blogging about these topics at www.literatureilluminations.org and most recently, consulting for other universities who want to learn more about her ideas. Two years ago at MLA, Petra already organized a session entitled “Literature and Digital Pedagogies” that was chosen as part of the presidential theme and drew a large crowd of interested MLA members. Alan Levine is recognized for expertise in the application of new technologies to education. A pioneer on the web in the 1990s and an early proponent of blogs and RSS, he shares his ideas and discoveries at CogDogBlog. Among his recent interests are new forms of web-based storytelling and encouraging acts of creativity (including 50+ Web 2.0 Ways To Tell a Story, pechaflickr, and a thing called the StoryBox), and is an adjunct online teacher of the open digital storytelling class, ds106 for the University of Mary Washington and George Mason University. Levine has held leadership technology positions at the New Media Consortium and the Maricopa Community Colleges. Currently he is providing education consultancy services as CogDog.it. His recent work revolves around application of syndication structures to create of project and course web sites with a distributed network structure for the Hague University of Applied Sciences, the Educational Technology MOOC, the Harvard School of Graduate Education, and Thompson Rivers University. Levine has authored several articles for EDCAUSE Review and most recently a chapter in Invasion of the MOOCs: The Promises and Perils of Massive Open Online Courses. Amanda Starling Gould is a media-lit scholar at Duke University investigating digital cultures, network ecologies, digital humanities scholarship, and innovative modes of pedagogy. She teaches digital humanities and media studies courses at Duke and has recently been presenting and leading workshops on digital pedagogy and assessing digital scholarship. She is a James B Duke Fellow, a HASTAC Scholar, one of the inaugural PhD Lab Scholars at Duke’s PhD Lab in Digital Knowledge (a member of the Praxis Network), and a newly anointed Duke ‘Flipping the Classroom’ Faculty Fellow. For more information, please see her website, amandastarlinggould.wordpress.com, where she posts updates about publications, research, digital projects, academic activities, and teaching.